Individual Retirement Accounts (IRAs) and 401k plans are long-term savings accounts that offer tax advantages if you comply with various Internal Revenue Service (IRS) regulations. While many financial services firms will not allow you to invest in real estate with your IRA due to increased paperwork requirements, the IRS does not forbid such investments. You can make transfers or take loans against your 401k to access the funds for investment. Careful planning with either type of retirement plan can result in little or no tax ramifications. 1) Contact your retirement plan administrator. As many IRA custodians do not permit real estate investments, you must determine whether your IRA is eligible for real estate purchases. While your 401k is restricted by law from investing in real estate, your administrator may have suggestions for how you can move your funds to access the real estate market. 2) Research loan regulations. While you cannot borrow against an IRA, you can usually borrow half of the value of your 401k account, up to $50,000. However, if you purchase real estate with funds outside of your 401k, you no longer have any tax advantages attached to your purchases. In order to keep taxation low, you must limit your income stream and capital gains to the best of your ability, but that would most likely run counter to the objective of your investment. 3) Open a self-directed IRA. If your IRA custodian does not permit real estate investments, you can open your own self-directed IRA at a firm that does permit such investments. 4) Roll over your 401k. Although you cannot invest directly in real estate in a 401k account, you can rollover your 401k into an IRA tax-free and then use the proceeds to invest in real estate. 5) Hire a real estate management company. If you purchase real estate through an IRA, you cannot actively manage the property. In order to enjoy the tax advantages of your IRA, you must hire an outside person or agency to perform maintenance on the property, collect rent and otherwise actively manage the investment. 6) Monitor cash flow. If you purchase real estate through a retirement account, all funds used to purchase the property must come from the account, and any proceeds such as rental income or sales proceeds must be returned to the IRA. If you follow these restrictions, your real estate investment will have little or no tax ramifications, just like all other investments within your IRA. Nashville is now widely considered the hottest real estate market in the country and continues to grow rapidly. Home Solutions can get you involved now! LOOKING TO INVEST DIRECTLY INTO REAL ESTATE? Let our team of experts guide you through the process of building your real estate portfolio. This would entail owning your own income properties that provide you with residual income. Many people successfully use this strategy to fund their retirement. The younger you are when you start building your portfolio, the better! WOULD YOU LIKE TO INVEST IN A REAL ESTATE COMPANY? 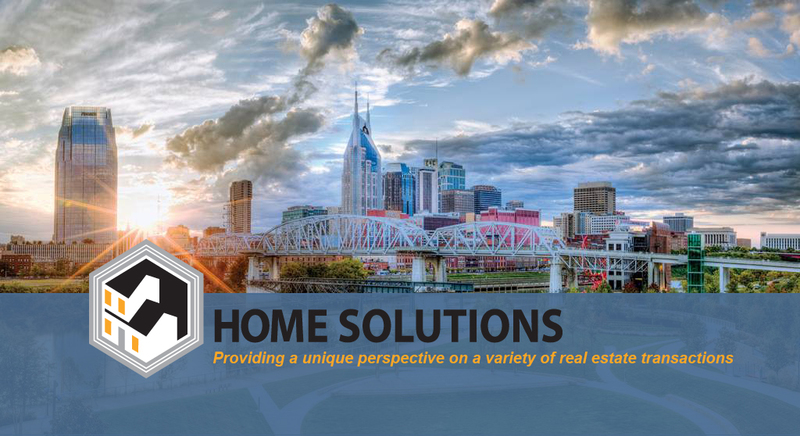 Home Solutions is a small local firm with a growing team of real estate professionals. We collectively have the resources and expertise to serve people through traditional listings as well as through unconventional transactions, providing a personalized perspective on practically any real estate challenge. We offer between an 8-10% annual return secured by real estate for our capital partners. We would greatly enjoy the opportunity to convince you of the value of becoming a partner with us, and will answer any questions you have.